As part of of my teaching degree, we had to go to an excursion venue and then make a presentation about it in a little Expo at uni. We chose Sovereign Hill and headed out there, it was a fantastic day filled with heaps of cool things to do and see. For those of you who don’t know, Sovereign Hill is a small historic village constructed entirely to mimic the goldrush times in rural Victoria. If you ever have the chance to check it out, do so! There were a number of old and beautiful crafts on display including knitting, quilt making, embroidery, blacksmithing and more. When we were putting together our display for the expo, I decided I wanted to make a little craft station where people could make peg dolls. I remember making them when I was small, and about half the students remembered them too, so it was a great nostalgic thing to do. A couple of students who swore they couldnt sew to save themselves had a go and were really pleased with the results! 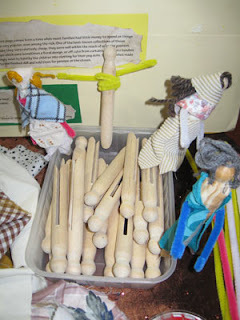 The tradition of making dolls out of wooden clothes pegs comes from a time when most families had little money to spend on things like toys. During the 19th Century, peg dolls were very popular, even among the rich. One of the best-known collections of these belonged to the young Queen Victoria, but because they were relatively cheap, they were well within the reach of even the poorest families. Remnant shops often sold fabric scraps which were sometimes a floral design, or off cuts from curtains, rolled into bundles and sold for 1/2d. 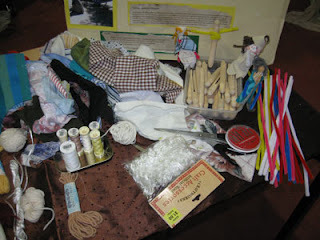 These scraps were then lovingly sewn by hand by the children into clothing for their peg dolls. Some families made them into peddler dolls adding little trinkets to the finished doll and sold them for pennies on the street. Wind the middle of pipe cleaner a few times around the peg just below the ‘neck’. Bend out the two ends to make arms, and twist the ends under to make hands. Wrap the material around the peg to make clothing and glue down. Glue the wool on for hair and draw a face with the sharpies. This can be done as part of a ‘history of toys’ lesson, or a ‘clothing of the past’ lesson or simply a fun activity during the goldmining unit. 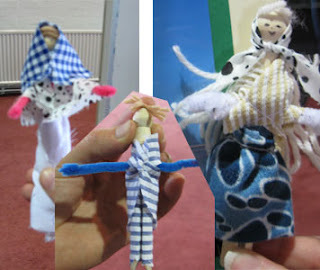 Below is three peg dolls made during the expo. You have a serving girl to the left, a convict man in the middle and a lady to the right. All in all a fun and highly successful activity to do! I particularly love the convict! I've just been sent a packet of these old-school pegs and have been thinking about what characters to make… thanks for the inspiration. Hey Gina, yeah, the convict rocked! It was made by a male who then went around convincing other lads they could do it too. It was great!